The Senckenberg Nature Research Society is looking for a PostDoc researcher in terrestrial or freshwater ecology in cooperation with the Faculty of Biology at the University of Duisburg-Essen. This entry was posted in Thesis/Job opportunities and tagged biodiversity, ecology, freshwater, post-doc, terrestrial on March 22, 2019 by Ve. University of Minho (UMinho) in Portugal is hiring a PostDoc for the project “STREAMECO: Biodiversity and ecosystem functioning under climate change: from the gene to the stream”. This entry was posted in Thesis/Job opportunities and tagged biodiversity, biomarker, climate change, ecosystem functioning, post-doc, stream on December 21, 2018 by Ve. The University of Québec and INRS-Eau Terre Environnement jointly offer a PostDoc and a PhD position in freshwater ecology based in Montréal. 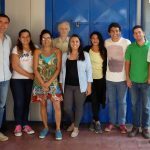 This entry was posted in Thesis/Job opportunities and tagged biodiversity, ecology, ecosystem service, freshwater, phd, post-doc on August 31, 2018 by Ve. In the scope of a PostDoc call in Catalonia, there is an opportunity on integrating biodiversity and ecosystem health into life-cycle assessment using freshwater salinization as a case study, jointly offered by researchers at University of Barcelona and University of Vic. This entry was posted in Thesis/Job opportunities and tagged biodiversity, effects, freshwater, life cycle, post-doc, salinization on July 27, 2018 by Ve. In this series of posts, Carsten Brühl reports about his current trip to Costa Rica. 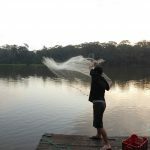 Part 4 is all about his visit of the Laguna de Madre Dios, where researchers sample water and fish to analyse for pesticide residues originating from upstream banana and pineapple plantations. This entry was posted in Cultural, Workshop/Meeting/Summer School and tagged aquatic ecosystem, biodiversity, fish, monitoring, pesticide, sampling on March 16, 2018 by Ve. This entry was posted in Thesis/Job opportunities and tagged avian, biodiversity, ecology, modelling, phd, range on February 16, 2018 by Ve. The Swedish University of Agricultural Sciences (SLU) in Uppsala is seeking a PhD student to work in environmental assessment with a focus on stream ecology within the Department of Aquatic Sciences and Assessment. This entry was posted in Thesis/Job opportunities and tagged biodiversity, ecology, ecosystem service, environmental assessment, phd, stream on August 31, 2017 by Ve. This entry was posted in Thesis/Job opportunities and tagged biodiversity, chemical stress, ecosystem functioning on October 9, 2015 by JPZ. In this post, Sebastian Stehle informs about their recently published paper “Agricultural insecticides threaten surface waters at the global scale”. This entry was posted in Research and tagged agriculture, biodiversity, environmental risk assessment, exposure, global surface waters, insecticide, Schulz, Stehle on May 26, 2015 by JPZ.